Tesla has added a new ‘Passive Entry’ function in its latest over-the-air software update that’s aimed at providing an additional layer of vehicle theft prevention. The new feature, first released in v8.1 2017.28.4 (cf44833) to select Model S owners across North America and Europe, and on a larger scale through v8.1 (2017.32.6 ca28227), guards against thieves that use electronic signal repeaters to gain unauthorized entry into a Model S.
The update follows reports that technology savvy thieves in the Netherlands and Sweden have been able to exploit Tesla’s keyless-entry system by fooling a Model S to think that an owner’s key is present and activate its auto-presenting door handles. It’s worth noting that all vehicles with keyless-entry or otherwise known as “keyless start” by some auto manufacturers are vulnerable to this exploit. It’s presumed that Model X will receive the same feature in a future update. Tesla’s newest Passive Entry mode for Model S will essentially disable the vehicle’s auto-presenting door handles unless a key fob is present and the driver physically depresses the key fob’s top button through a double-click action to unlock and extend the door handles. To activate the new security feature, Model S owners will need to go to the Settings tab on the center touchscreen, then to the Doors & Locks menu where a new Passive Entry toggle has been added. By default, Passive Entry is set to ON meaning the door handles will auto-present. Those looking to disable the feature entirely can toggle it to OFF. 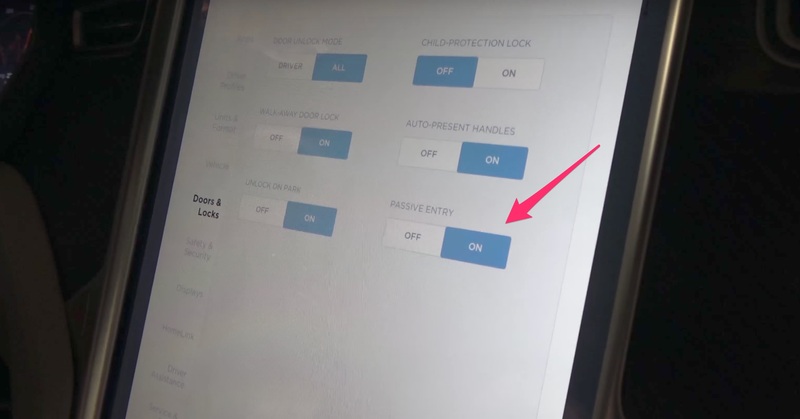 Watch as Model S owner and Tesla Referral Program powerhouse, DÆrik, demonstrates this latest security feature in their latest video.